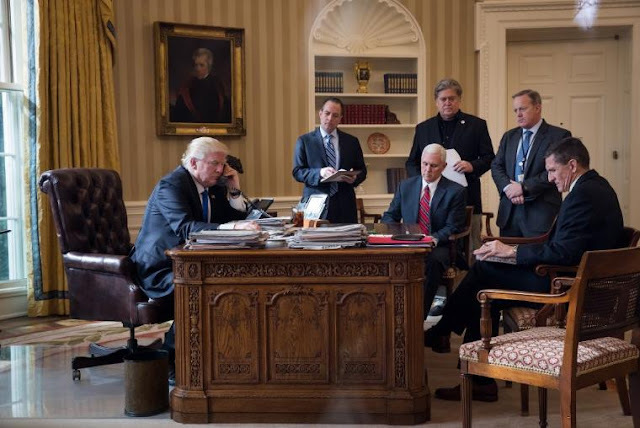 The Washington Post in its recent article, “Trump orders ISIS plan, talks with Putin and gives Bannon national security role,” attempts to portray US President Donald Trump’s recent moves as “anti-terror” in nature. However, fighting terrorists downstream from their state sponsors is a losing battle. In US commander of US Forces Afghanistan General John Nicholson’s December 2016 briefing on the continued US occupation of Afghanistan, he repeatedly noted the difficulties of defeating militants in the Central Asian state due to support and safe havens they enjoyed in neighboring states, including Pakistan. General Nicholson, of course, was referring to the Taliban, not Al Qaeda or the so-called “Islamic State” (ISIS). These two terrorist organizations may have networks extending into Pakistan and elsewhere, but by both President Trump’s own National Security Adviser Michael Flynn’s admission – as revealed in a leaked 2012 Defense Intelligence Agency (DIA) memo – and even by Trump’s 2016 presidential opponent, Hillary Clinton’s acknowledgement in leaked e-mails – Saudi Arabia and Qatar are the premier state sponsors of these two notorious terrorist networks – since their inception. 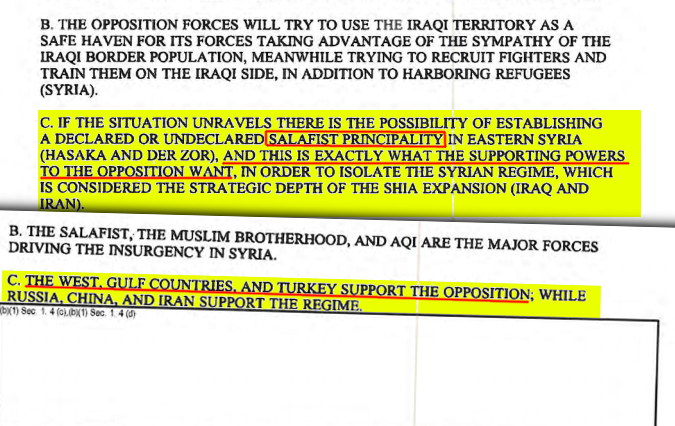 It should also be noted that not only did the 2012 DIA memo reveal Saudi Arabia and Qatar as state sponsors seeking the rise of what it at the time called a “Salafist principality,” but it also included the United States, Europe, and Turkey as seeking such an adversary with which to “isolate” the Syrian government. 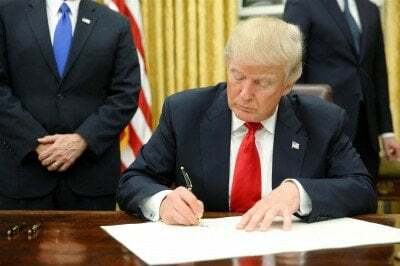 Yet, now as US president, signing off on multiple, intentionally distracting and controversial executive orders – including one targeting migrants from seven majority Muslim nations the US and Saudi Arabia jointly destroyed over the past 20 years, mention of Saudi Arabia and the role it has played in sponsoring terrorism worldwide is absent. Like all politicians and every US president before Donald Trump, talk is cheap – used to target and manipulate the weakest minds among any nation’s population. Action, however, is more difficult to manifest among deficient and/or dishonest politicians and political parties. 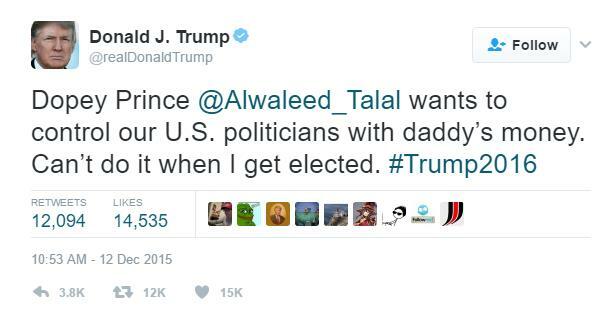 That President Trump is continuing America’s partnership in terror with Saudi Arabia should be of no surprise to the public. Trump – even during his presidential campaign last year – surrounded himself with Bush-era Neo-Conservatives and policymakers, corporate-financier elitists, and the right-wing counterparts of the corporate media, including those elements cleverly disguised as “alternative media” such as Breitbart News. Objective adults weigh words against actions. Across the West, however, both President Trump’s opponents and supporters appear mesmerized by his words, and entirely oblivious to both his actions and their implications. For President Trump’s actions to match his words – US military, political, and financial support for the regimes in Riyadh and Doha would by necessity need to end. The exposure and sanctioning of Saudi-Qatari terrorism, including those Western interests who used both nations as proxies to wage war in Syria, Libya, Iraq, and beyond, would also by necessity be required. The likelihood of President Trump doing any of this is nonexistent. For the public, instead of being pulled into the rhetorical black hole the Western corporate media is intentionally creating, identifying the corporate-financier special interests driving this US-EU-Gulf collaboration, exposing them, then isolating and entirely replacing them must take priority.